To analyze the foveal avascular zone (FAZ) area in superficial and deep retinal layers in patients with macular hole (MH) before and after surgery. The authors studied 14 patients with unilateral MH. They examined a 3 mm × 3 mm area at the fovea before and 6 months after surgery using spectral-domain optical coherence tomography angiography. In eyes affected by MH, the mean preoperative superficial FAZ (0.45 ± 0.09 mm2) and deep FAZ (0.79 ± 0.39 mm2) were significantly larger than the postoperative superficial FAZ (0.25 ± 0.09 mm2) and deep FAZ (0.31 ± 0.12 mm2), respectively (P < .001). The mean preoperative superficial FAZ of the affected eyes was the same as that of control eyes (0.41 ± 0.10 mm2) (P = .23), but postoperative superficial FAZ was smaller than that of control eyes (P < .001). The mean preoperative deep FAZ was larger (0.48 ± 0.11 mm2) (P = .019), but mean postoperative deep FAZ was smaller than that of control eyes (P < .001). The authors revealed preoperative deep FAZ areas were more enlarged centrifugally than preoperative superficial FAZ in MH. Both postoperative superficial and deep FAZ showed more centripetal contraction than those of the preoperative period. Baba et al.5 recently reported how vitrectomy and macular surgery for MH affect the retinal vasculature in the foveal area. However, they reported only superficial FAZ in MH observed by OCTA before and 3 months after surgery.5 They mentioned that they did not analyze the deep layer vascular plexus because FAZ in the deep layer may vary due to projection artifacts obscuring the FAZ borders. To better understand the morphological changes of the FAZ in eyes affected by MH, we analyzed the changes in OCTA findings of FAZ not only in the superficial vascular plexus, but also in the deep vascular plexus before and after surgery for MH for a longer postoperative duration of 6 months. We retrospectively studied 14 eyes of 14 consecutive patients (four men, 10 women) with unilateral MH who received surgery at Nihon University Hospital, Tokyo, Japan, between February and June 2016, and followed the subjects until December 2016. This study was approved by the institutional review board/ethics committee of Nihon University Hospital (Approval number: 20170204/UMIN000026065). Written informed consent to undergo the procedure was obtained from all patients. The inclusion criteria were: patients with unilateral MH undergoing vitrectomy combined with removal of the internal limiting membrane (ILM); availability of pre- and postoperative OCTA images of good quality; and no abnormalities in the fellow eye. OCTA images were acquired by experienced photographers. Patients with myopic refractive error exceeding 6.0 diopters (D) and/or a history of other retinal diseases, such as ocular inflammation, diabetic retinopathy, age-related macular degeneration, retinal vasculitis, or a history of intraocular surgery, were excluded from this study. The OCTA images were manually segmented and individually captured and converted to JPEG and imported into ImageJ software (version 1.48; National Institutes of Health, Bethesda, MD). A single observer (FH) measured all FAZ areas. If a cystic pattern was found in an eye with MH, the observer measured the darkest area (Figure 1).7 Using ImageJ, area and pixel statistics were calculated according to user-defined selection. The area of FAZ was determined on vascular image of the superficial retinal layer (superficial FAZ) and that of the deep retinal layer (one of the four slabs provided automatically by the instrument). The superficial capillary plexus was determined to be between 3 μm below the ILM to 15 μm below the inner plexiform layer. The deep capillary plexus extended from 15 μm to 70 μm below the inner plexiform layer. We used “freehand selections” to manually outline the borders of FAZ and selected “analyze” to calculate the size of each area examined. 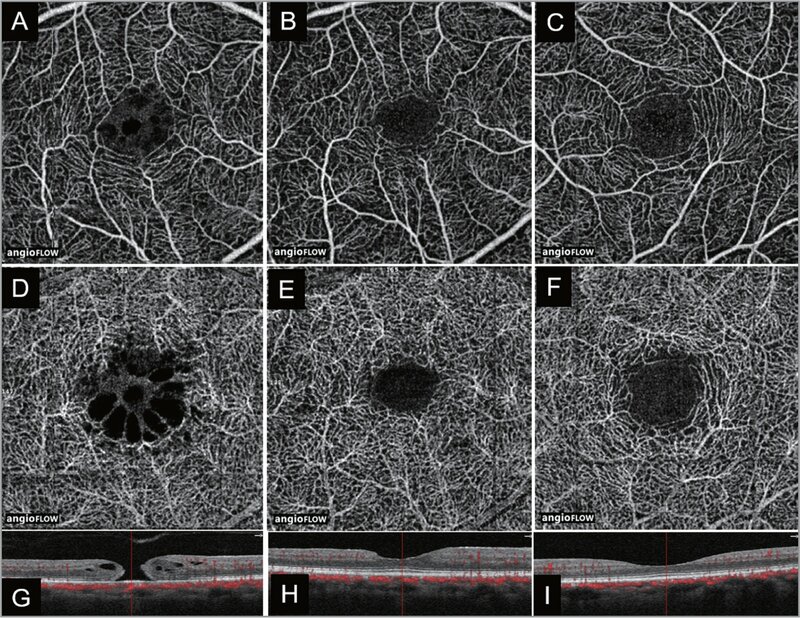 3 mm × 3 mm optical coherence tomography angiography images of an eye with macular hole having a cystic pattern, showing (A) the superficial layer before surgery, (B) the superficial layer 6 months after surgery, (C) the superficial layer in the fellow eye, (D) the deep layer before surgery with the appearance of a cystic structure, (E) the deep layer after surgery (the cyst structure has diminished and the foveal avascular zone is smaller), and (F) the deep layer of the fellow eye. G-I are tomographic images of each eye in A and D, B and E, and C and F, respectively. The CRT was determined on cross-sectional tomographic images through the foveal center. The average CRT obtained from vertical and horizontal OCT images was used for statistical analyses. Twenty-five-gauge or 27-gauge vitrectomy was conducted using a Constellation system (Alcon, Fort Worth, TX). All surgeries were performed by two of the authors (HN and AS). Surgery was conducted under retrobulbar anesthesia in all patients. Incisions were made at an angle of 30° to the sclera and parallel to the limbus, and three valved cannula trocar systems were inserted obliquely in a one-step procedure.8 A Resight 700 (Carl Zeiss Meditec, Oberkochen, Germany) was used for posterior visualization. ILM was removed using 27-gauge ILM forceps (Alcon, Fort Worth, TX) and plano-concave contact lens (Hoya, Tokyo, Japan). The ILM was peeled after staining with Brilliant Blue G (BBG). The BBG solution was prepared by dissolving BBG (BBG 250; Sigma-Aldrich, St. Louis, MO) in BSS PLUS (Alcon, Fort Worth, TX) to a final concentration of 0.25 mg/mL (0.025%), according to the method of Enaida et al.9 Simultaneous cataract surgery was conducted in patients 50 years of age or older because cataract tends to progress after vitrectomy. Cataract surgery was conducted using two types of viscoelastic materials; Viscoat (Alcon, Fort Worth, TX) and Healon (AMO, Uppsala, Sweden). Phacoemulsification (Constellation; Alcon, Fort Worth, TX) was performed through an incision in the superior cornea. Fluid-air exchange was then performed. Nine percent perfluoropropane (C3F8) gas was used as tamponade in all patients. The patients were instructed to remain in a prone position for at least 24 hours after surgery. Primary outcome measures were preoperative and 6-month postoperative superficial and deep FAZ areas in the eyes affected by MH and fellow eyes. Secondary outcome measures were BCVA, spherical equivalent, AL, CRT, and minimum and maximum vertical and horizontal diameters of MH. Statistical analyses were performed using StatView (SAS Institute, Cary, NC). Data were expressed as mean ± standard deviation (SD). Paired t-test or Mann-Whitney test was used to analyze differences between groups. We used the Pearson product moment correlation coefficient to analyze the correlations among CRT, minimum MH diameter, maximum MH diameter and superficial FAZ and deep FAZ. P values less than .05 was considered to be statistically significant. Fourteen eyes of 14 patients with unilateral MH who met the inclusion criteria were studied and followed for 6 months postoperatively. We classified MH according to the International Vitreomacular Traction Study Group.10 Macular holes of different stages and sizes were included in this series (Table 1). Tables 1 and 2 show the pre- and postoperative patient data. The mean patient age was 65.6 years ± 6.6 years (range: 50 years to 75 years). Preoperative spherical equivalent was −0.77 D ± 2.07 D, and postoperative spherical equivalent was −0.55 D ± 1.66 D (Tables 1 and 2), with no significant difference (P = .36). 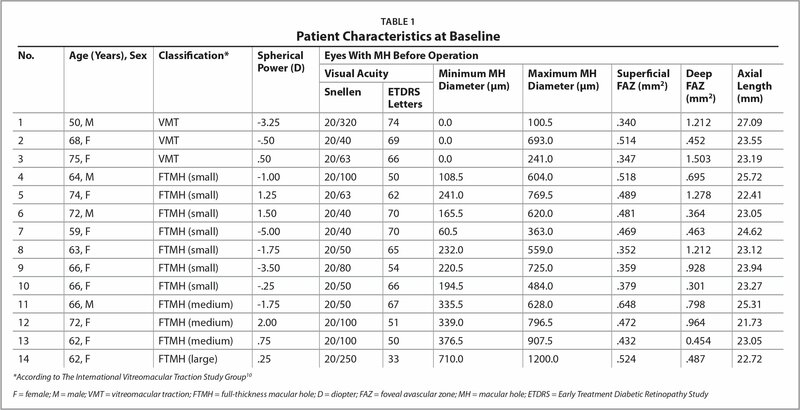 For the eyes with MH, mean visual acuity (VA) (ETDRS letters) was 60.5 ± 11.3 (mean BCVA in logMAR: 0.58 ± 0.28) before surgery and 80.6 ± 6.5 (mean BCVA in logMAR: 0.29 ± 0.31) after surgery (P < 0.01). The mean superficial FAZ was larger before surgery (0.45 ± 0.09 mm2) than after surgery (0.25 ± 0.09 mm2) (P < .001). Likewise, the mean deep FAZ was larger before surgery (0.79 ± 0.39 mm2) than after surgery (0.31 ± 0.12 mm2) (P < .001). The mean superficial FAZ in the affected eye before surgery was the same as that in the fellow eye (control group: 0.41 ± 0.10 mm2) (P = .23), whereas the mean superficial FAZ after surgery was smaller than in the fellow eye (P < .001). The mean deep FAZ in the affected eye before surgery was larger than that in the fellow eye (0.48 ± 0.11 mm2) (P = .019), whereas the mean deep FAZ after surgery was smaller than that in the fellow eye (P < .001). The mean AL of the affected eye (23.8 mm ± 1.4 mm) was not significantly different from that of the fellow eye (23.8 mm ± 1.5 mm) (P = .96). The mean minimum vertical MH diameter was 230.79 μm ± 195.25 μm before surgery and 0.0 μm ± 0.0 μm after surgery. The mean minimum horizontal MH diameter was 222.50 μm ± 692.00 μm before surgery and 0.0 μm ± 0.0 μm after surgery. The mean maximum vertical MH diameter was 592.93 μm ± 263.77 μm before surgery and 0.0 μm ± 0.0 μm after surgery. The mean maximum horizontal MH diameter was 647.78 μm ± 290.19 μm before surgery and 0.0 μm ± 0.0 μm after surgery. Both pre- and postoperative differences were statistically significant (P < .001). The rate of successful hole closure was 100% (Figures 1 and 2). 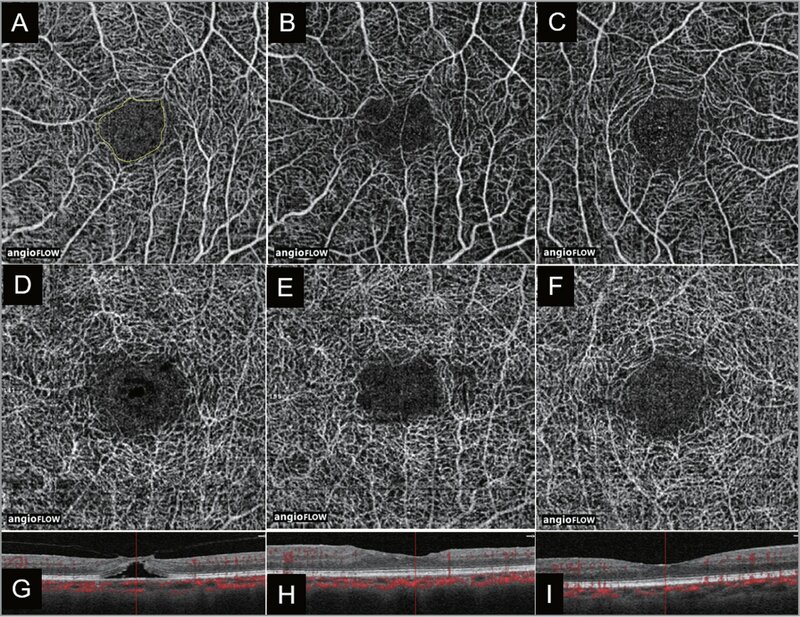 3 mm × 3 mm optical coherence tomography angiography images of an eye with impending macular hole, showing (A) the superficial layer before surgery, (B) the superficial layer 6 months after surgery, (C) the superficial layer in the fellow eye, (D) the deep layer before surgery, (E) the deep layer after surgery, and (F) the deep layer in the fellow eye. The borders of the foveal avascular zone have been manually outlined. G-I are tomographic images of each eye in A and D, B and E, and C and F, respectively. The mean CRT in the affected eye after surgery (216.7 μm ± 38.3 μm) was greater than that in the fellow eye (187.0 μm ± 37.2 μm) (P = .04). However, CRT in the affected eye after surgery showed no significant association with minimum MH diameter (P = .62), maximum MH diameter (P = .61), superficial FAZ (P = .76), and deep FAZ (P = .14). Recently, Liu et al.13 reported the presence or absence of vitreomacular traction in cases of MH treated surgically. They reported that the presence of vitreous traction correlated with a trend toward better VA over time, although there was no significant difference. Moreover, they reported that the presence of vitreous traction correlated with better anatomical restoration of outer retina layers over time. In all our MH cases, VA increased postoperatively irrespective of the presence or absence of vitreomacular traction, and complete MH closure was achieved. In our study, we found that the FAZ, both in superficial and deep retinal layers of eyes with MH, were larger before surgery than after surgery, and that the mean preoperative superficial FAZ in the affected eye was the same as that in the fellow eye. These findings suggest that, on average, the superficial layer may be unaffected by MH formation. On the other hand, the mean preoperative deep FAZ was larger than that in the fellow eye. In our study, cystic structures were found in 11 cases (Figure 1), and the cyst formation was observed only in the deep layer. Mammo et al.14 demonstrated that capillaries in the deep layer terminated farther from the fovea than capillaries in the superficial layer, which may partially explain the differences observed in our study. The mean CRT measured after surgery was significantly greater than that in the fellow eye. Pak et al.15 reported that the topographic changes after MH closure might occur via several mechanisms such as elasticity of the retina after removal of the ILM, centripetal contraction of the macula, as well as the contraction force exerted by the retinal nerve fiber layer, which may also explain our results. However, postoperative CRT showed no statistically significant association with minimum MH diameter, maximum MH diameter, superficial FAZ, and deep FAZ. These results may suggest that CRT is unrelated to parameters such as MH diameter and FAZ. This study has several limitations. This study was a retrospective study with a small number of patients. Moreover, one case (No.14) had large MH diameter compared to others, which may have affected the reliability of the statistical analysis. We manually measured superficial and deep layers in eyes with MH, and there was difficulty in manual segmentation, especially for FAZ in the deep layer. In summary, the superficial FAZ area was the same between MH eyes before surgery and fellow eyes. Due to this being a low-powered study, we were not able to demonstrate a statistically significant difference in the superficial FAZ area in MH; however, there was a trend for the superficial FAZ area to be increased preoperatively as compared to the fellow eye, similar to the study by Baba et al. On the other hand, the deep FAZ area was significantly larger in MH eyes than in fellow eyes, which might be due to cystoid space formation in this layer. We were not able to find a statistical difference in this low-powered study in the superficial FAZ area in MH. FAZ sizes in both superficial and deep layers were smaller after surgery compared to before surgery in the same eyes and were also smaller than the respective FAZ sizes in fellow eyes, suggesting that centripetal contraction of the macula may result in closure of the hole. Further study is needed to determine the etiology of MH. Enaida H, Hisatomi T, Hata Y, et al. Brilliant blue G selectively stains the internal limiting membrane/brilliant blue G-assisted membrane peeling. Retina. 2006;26(6):631–636. Liu L, Enkh-Amgalan I, Wang NK, et al. Results of macular hole surgery: Evaluation based on the International Vitreomacular Traction Study Classification. Retina. Apr20. doi:10.1097/IAE.0000000000001647 [CrossRef]. [Epub ahead of print]. From the Division of Ophthalmology, Department of Visual Sciences, Nihon University School of Medicine, Tokyo, Japan (FH, AS, HN, AK, HS); and Jakarta Eye Center, Jakarta, Indonesia (FH). Address correspondence to Ari Shinojima, MD, PhD, Department of Ophthalmology, Nihon University Hospital, 1-6 Surugadai, Kanda, Chiyoda-ku, Tokyo, 101-8309, Japan; email: ariearly7@gmail.com.